Digitize your worker’s day with secure access to remote expert guidance, digital work instructions, and augmented content in even the most difficult field environments. Empower your workers and customers with immediate access to the content, people, and guidance they need to solve issues quickly. 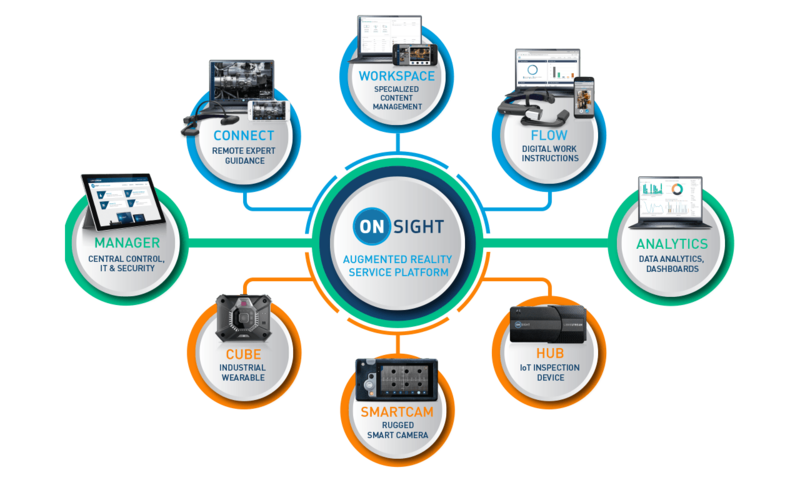 With a broad range of software capabilities and optional inspection accessories, Onsight is the most comprehensive augmented reality enterprise software on the market. Use the Connect remote expert software on mobile or wearable devices, or deploy the full Onsight platform to include Flow for digital work instructions and Workspace to centralize content. Connect test instruments using the Hub or Smartcam and add the power of a thermal imaging industrial wearable with the Cube. Mobile Video for Enterprise – What’s the Difference? – Learn about the difference between video chat and virtual presence. The Onsight Augmented Reality Service Platform is built to perform in rugged environment including areas with extremely low bandwidth. Backed by central management, Onsight offers valuable insights through robust data analytics and dashboards. Connect teams with the enterprise leading remote expert solution. Engage remote experts with live video, audio, telestration, text, and images. Transform paper-based procedures with digital work instructions. Create, assign, and execute work instructions and analyze data. Create a knowledge base of images, videos, documents and more for training and mentoring. Share, access, and view content securely in difficult field environments. Use optional specialized accessories for unique inspection use cases. Collaborate hands-free, connect test instruments, and gather dimensioning data. The entire Onsight Platform is supported by a variety of professional services to ensure you receive the most out of Onsight. Services include technical support for immediate access to Onsight experts, TDA (Training, Deployment and Adoption) to maximize your Onsight deployment, and Custom Branding Services to seamlessly fit within your brand. To learn more how Onsight professional services visit our services page or contact your Onsight sales representative.